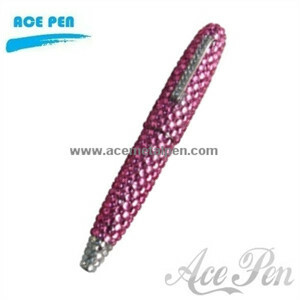 Surface Treatment Crystal Metal pen with elegant design,produced by Swarovski crystal. solid brass barrel diamond-mounted with chrome trims,crystal parts decoring.High quality and noble design. Style Made from various colors and styles.Available in various kinds of crystal pens With ordinary Chinese stones, Swarovski stones.Elegant metal pen with quality crystals in barrel of pen. Different styles and sizes. Refill Standard metal refill. Long shelf-life refill about 1 years -2 years. Pen barrel color Different colors of diamond-edged barrels are available.